Nat Commun, 2016, 7:13616. RO4929097 purchased from Selleck. Western blot analysis of MDA-MB-231 cells treated with CCL2/7/8 or PBS in the presence or absence of a γ-secretase inhibitor (GSI) RO4929097 (10 μmol/L). Clin Cancer Res, 2018, 24(10):2370-2382. RO4929097 purchased from Selleck. (F–H) Representative z-projection confocal images of the principal islets in dissected pancreata (post-paraformaldehyde fixation) fromTg(ins:hmgb1-EGFP; β/δ-reporter ) triple transgenic lines treated with DMSO (F), paroxetine (G), or RO4929097 (H). Shown are EGFP+ β-cell nuclei (green) and TagRFP+ δ cells (red); note, PhiYFP in the β/δ-reporter line does not withstand fixation, allowing ‘clean‘ labeling of β-cell nuclei with EGFP. In addition, apparent overlap between the β-cell and δ-cell markers (i.e., occasional ‘yellow‘ cells) is an artifact of z-projection images shown in 2D format. For clarity, the inset panels show a single z-slice image of partial islet showing no co-localization of cell type specific reporters. Elife, 2015, doi:10.7554/eLife.08261. RO4929097 purchased from Selleck. Stem Cells 2014 32(1), 301-12. RO4929097 purchased from Selleck. left, Increasing doses (0 μmol/L, 3 μmol/L, 30 μmol/L) of GSI RO4929097 inhibits sphere formation in RD and SMS-CTR spheres; right, Expression of YAP5SA in the presence of GSI restores sphere formation. Mol Cancer Res, 2017, 15(12):1777-1791. RO4929097 purchased from Selleck. 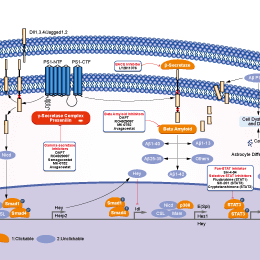 Melanoma growth inhibition by the concomitant treatment with a TKI and the GSI inhibitor RO4929097. WM266-4, K457 and SK-Mel2 human metastatic melanoma cells were treated for four days in culture with a tyrosine kinase inhibitor (TKI at 20 mM), and the GSI RO4929097 (RO at 10 mM), either alone or in combination. All treatments significantly reduced cell growth except for RO4929097 on K457 cells. The highest level of inhibition was observed with TKI in combination with RO4929097. Growth was evaluated by the crystal violet staining. 2012 Dr. Barbara Bedogni of Case Western Reserve University. RO4929097 purchased from Selleck. Luistro L, et al. Cancer Res. 2009, 69(19), 7672-7680. Debeb BG, et al. Breast Cancer Res Treat. 2012. Huynh C, et al. PLoS One. 2011, 6(9), e25264. He W, et al. Mol Oncol. 2011, 5(3), 292-301. Li YM, et al. Proc Natl Acad Sci U S A. 2000, 97(11), 6138-6143. How about the half-life of RO4929097(S1575)? 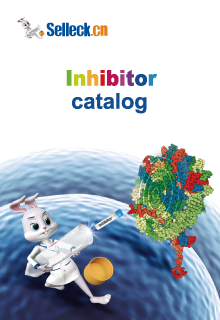 Features:MK-0752 is a moderately potent γ-secretase inhibitor.